I was recently presented with an opportunity to run a little gas mileage experiment. I’ve done this in the past when I investigated the degree to which I could improve my gas mileage by altering my driving habits around town. Interestingly, I was able to increase my mileage by 15% in return for a few minor driving tweaks. This time, I had to make a 350 mile roundtrip on the interstate. As such, I decided to drive “normally” on the way out, and to go out of my way to keep my speed in check on the way back. I filled my tank at the beginning, at the turnaround point, and at the end. Thus, I was able to calculate my mileage for each leg. For background, I have a 2005 Honda CR-V that’s supposed to get 23 city mpg and 29 highway mpg. As noted above, I drove “normally” on the way out of town. For me, this meant running at roughly 75 mph. In order to keep things as accurate as possible, I decided to use the cruise control to hold my speed steady. While I realize that I could’ve done a good bit better mileage-wise if I had controlled my speed manually (especially on hills), I wanted this to be an apples-to-apples comparison. Upon arriving at my destination, I learned that my outbound mileage was 25 mpg. On the way back, I decided to ratchetthe cruise control down to 65 mph and hang out in the slow lane with the trucks. At the end of the trip, I was surprised to learn that I had achieved 32 mpg – that’s a 28% improvement! To be fair, I was driving into a bit of a headwind on the way out, and had the wind at my back on my return. Then again, it was considerably warmer on my return trip, so I had to turn on the A/C to stay cool. While I fully expected to see an improvement, I was a bit surprised by how much of an impact slowing down had on my mileage. Of course, that 28% improvement was based on a relatively small amount of data (i.e., one roundtrip of 175 miles each way), so it might not be entirely accurate. Nonetheless, speed obviously has a pretty major impact on highway mileage. Is slowing down worth the trouble? Sure, slowing down saves gas. But in an economic sense, was it worth it? Let’s take a look at the numbers… For simplicity, I’ll base my calculations on a 100 mile trip and $4/gallon gas — you can easily extrapolate from there. At 75 mph… 100 miles would take 1:20, and would consume 4 gallons of gas. At 65 mph… 100 miles would take 1:32, and would consume 3.125 gallons of gas. So… I’d spend an extra 12 minutes on the road, but would save 0.875 gallons of gas at an estimated cost of $3.50. Extrapolating this out to an hourly rate, I could “earn” $17.50 per hour (tax free!) of extra driving, not to mention the environmental benefits of burning less fuel. Not bad considering I was relaxing and listening to podcasts the entire time. While your mileage may (quite literally!) vary depending on your vehicle of choice, driving style, etc., the bottom line here is that you can definitely save a few bucks (and be a bit greener) by slowing down. What’s the Most You’ve Ever Paid for a Tank of Gas? @nickel: you’re right, that’s why I used the phrase “leaving the car parked….” This has reduced my fuel consumption this year by about 80%. I’m enjoying a chuckle too because I am male, not female. My bearded face on my website gives it away, but my first name can be misleading on these posts. Frankly, when there isn’t a mix up, I’m surprised. skidding: She He means that by choosing not to drive around, she he saves gas. She He doesn’t improve her his mileage, as she’s he’s not going anywhere. But she he doesn’t burn gas. – What do you mean by parking your car? Turning ignition off at long stoplights? – If it reduces your consumption of fuel for the same amount of distance you drive… how does that not lower your mpg? *edit – oops, I get it, you don’t drive your car to begin with. i drive a 9 yr old honda civic that epa rates 29/35 miles per gallon. by driving no faster than 60, no jackrabbit stops and most importantly, minimimzing braking, i achieve an average 38 miles per gallon and have gotten as much as 42 miles per gallon. so it’s definitely worth it. This is what I do, and I get 33 mpg on a 1998 Buick LeSabre (rated at 26 mpg Highway) with 146K miles on it! I drive 55 mph on the interstates and I “draft” trucks. No, I don’t ride their bumpers because, quite frankly, I want to live. I ride about 150 ft back, which still gives me plenty of stopping distance, and it won’t upset the semi driver. A while back, MythBusters did a show on it, and it only confirmed what I had thought all along. A car can draft a tractor trailer at up to 200 ft away, and still increase gas mileage by up to 10%. It’s when the cars get really close, that they dramatically (30%+) improve mileage. Although, if you get too close, you are likely to end up an ornament on their trailer, and it’s just plain unsafe. Going 55 mph has it’s drawbacks, and in my State, the minimum Interstate speed is 45 mph. I have yet to be given a dirty look or gesture, as most people just pass without incident. Others, I have found, actually slow down and match my speed. I get a kick out of the drivers that fly by me at 80 mph, only for me to catch up with them at the first stoplight exiting the freeway to downtown. They just blew a couple of bucks in gas out of their tailpipe, and still don’t beat me by more than a minute or so. I commute 70 miles one way to work every day, so anything I can do to improve gas mileage is worth every penny. Take it for what it’s worth. But I am able to spend the $15 or so that I save on other things besides gas! Speed has a big influence on fuel economy because of all the air you push out in front of your car just to maintain a higher speed. For most automatic transmissions, 40 to 45 mph is optimal. At 40 to 45 mph, your transmission is locked up, your engine is running at an efficient rpm, and you aren’t fighting a lot of air in front of the car. Of course, those slower speeds are not safe or practical on the freeways because they often have a 45 mph minimum speed, and many vehicles will be passing you doing 30 to 40 mph faster. Nevertheless, at highway speeds, mpg clearly goes down as speed goes up. The drawback comes if you try to drive across the country at 5 mph below the speed limit. This adds many hours to the driving time, and each day you’ll have to drive longer to compensate. Sometimes you just can’t spare the extra hours, and being longer behind the wheel can also be unsafe. The key is to identify what gives you the biggest return on investment for the driving that you need to do with your vehicle. Grab the large savings and don’t worry too much about fine tuning it to a science. I find that leaving the car parked doesn’t improve my mpg, but it greatly reduces my consumption of fuel, and that saves me way more money than any fuel efficient driving technique. Going less than the speed limit is not against the law. There are required minima and maxima. As long as you’re between them, you’re legal. As for slowing down without impeding traffic, just hang out with the trucks in the slow lane. I am all for slowing down, but going less than the speed limit is against the law and dangerous. Other drivers on the road have the reasonable expectation for other around them to be following the rules of the road. Anything otherwise (going too fast or too slow) is reckless. Hypermilling, cruising the car in neutral can be dangerous. But more important if you “roll” through a stop sign and cop catches you it can be a ticket! Cost more than the gas necessary to stop! Good question, Jon. As it turn out, the outbound (high speed) trip was slightly downhill, wheras as the return (lower speed, higher mileage) trip was uphill. The end points differed only by about 100 vertical feet but, if anything, the elevation difference would have narrowed the mpg difference. You cruise on neutral for 1.5 miles home? Very impressive, I roll about 0.5 mile home every night. And I thought I was the only creepy one driving home late at night at speeds as slow as 2mph. Also it helps when ur car is about to come to a complete stop at the peak of a hill, I like to “bump” the car forward by quickly pulling my body forward as hard as I can and then pushing the car for an extra jolt. This week I’m going to experiment by opening the door and pushing the car with my legs as I reach hard to cross uphills. I’d be curious if they was an elevation difference between the 2 endpoints in your trip. Driving a net uphill trip uses more gas than a net downhill trip. not to mention that there is a safety factor involved in slowing down and also forcing to plan extra time rather than racing for only 12 minutes over 100 miles. there is also a sweet spot in your accelerator. most people are continually accelerating to maintain speed even though you do not need to do so. I recently came to a simular conclusion. I didn’t fill up my gas tank until it hit “E” For backround I drive a Chevy 1500 truck. Before gas prices went up to $4 I was paying around $65 a week. After testing the idea by just driving my truck to work and back and a few extra places I realized I could go 3 weeks before my next fill up. What makes it even better is that I only paid $27 a week versus $65 a week saving me $38 a week by conserving my gas. Stacey: The windows vs. A/C issue has been hotly (no pun intended) debated. Some one is better than the other, some say it doesn’t make a difference. I think the best solution probably depends on the car and driving conditions. Nonetheless, my outbound run was done with windows up and the A/C off so, if anything, my high-speed mileage estimate was generous. A side note: If you’ve got a choice between AC and opening the windows on the highway, it’s been said that AC gets better milage. An open window impacts the air stream and creates drag. But there are so many variables, so it’s great that you’re all aiming for better milage in any case. 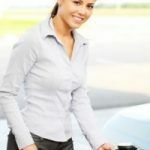 When gas spiked a few weeks ago I noticed a lot of people slowing down. But now people are back to their normal pace. When you actually do the math on gas consumption and how it effects your budget you realize how much of a luxury owning a car is. But apparently a lot of people just don’t get it. And its the people in the crappiest cars that seem to be going the fastest. I did this a few years ago when the price of gas spiked due to hurricane Katrina. I was getting ~28-30mpg, but when I made a conscious effort to slow down (55 on the highway, at or below other posted limits) I went up to 33-36mpg. 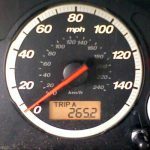 As I tracked it over the years since then, I’ve found that I get my best mileage in March through June, and in September through November, at 36-38 mpg. In July and August, I’m running the A/C, and it goes down to 31-33. In December through February, there is more internal friction due to cold weather (central Missouri winters) and I only get 29-31mpg. This is an excellent case study. It really hits home for me as I also have a Honda CRV (2003) and love it! You really can’t beat it for reliability, fuel economy and safety – especially the All Wheel Drive models. There’s this 1 1/2 mile stretch at the end of my drive home where i try and go the entire time without hitting the gas pedal 🙂 there are 2 up hills, followed by one down hill – so as long as i make it up that last up hill i’m smooth sailing…. So far i’ve only been able to do it once starting out at 29 miles per hour. I could pull it off every day if no one else was around me, but going 2-3 miles an hour on that last stretch can really piss some people off! I noticed a huge difference as well going from 80 to 60-65. But it’s fine for shorter drives like 100 miles but 200-400 it makes a lot harder to sit still. I just in general try to drive more conservatively. Less braking in general and not as much stop and go. So even on surface streets I try to not gas and go. Instead just drive calmly and I get 30 mpg, before I’d get maybe 27-28. And it’s all city driving.